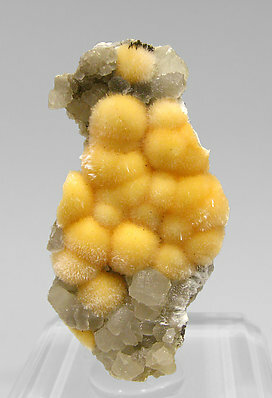 A fine piece with globular growths of good yellow color, on matrix and with Calcite crystals. These samples from this locality are destined to become the classics for the species. 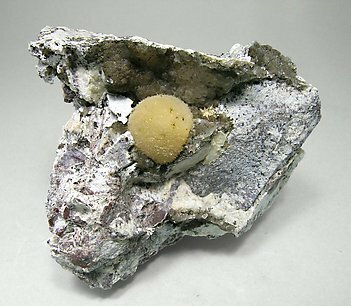 Globular growth of yellow Ferrierite, with small aggregates of fibrous Mordenite and small crystals of Analcime on a matrix rich with Calcite. This specimen was photographed for the ‘what’s new at Munich 2008’ section of the magazine ‘Mineralien Welt’ and appears on page 11 of number 1/2009.